Start by deciding what size and shape pillow you want; or start with the block you want to use and decide what size/shape pillow form to buy. Many orphan blocks to choose from! Once you have that pillow form home, measure from seam to seam to be sure it’s the size you think it is. Add 1/2 inch to each dimension for seam allowances and you have the size to cut (or assemble) the front and back pieces. For example: Pillow form here is 16 x 16, so I’ll make the (unfinished) front and back pieces 16-1/2 x 16-1/2 inches. I stated with an improvisationally pieced log cabin block and added logs to 2 sides to make it big enough. While I was at it, I added pieces wider than I needed to allow for shrinkage during quilting and squaring up the final top. To make the pillow cover easy to remove, I make an overlapping closure in the back. It’s also fine to add a zipper to one of the edge seams IF you’ve got a zipper, and of course if you know how to put one in. I do that sometimes, but there are lots of places on the web that show you how to put in a zipper, so I’m not doing it here. To make the overlapping back: Divide back width by 2 (16-1/2 divided by 2 = 8-1/4 in my case) and then add enough to each piece for overlap and hem. “Enough” should be proportional to the size of the pillow, but in this case I added (8-1/4″ for back and one seam allowance + 1-1/4″ for hem + 2″ for overlap = 11-1/2″, which I rounded up to 12″). So I cut two back pieces 12″ x 16-1/2″, then finished one of the long sides on each piece with a hem of 1/4″ first turn + 1″ second turn. Next, I layed out the backing pieces with hemmed edges overlapping to make a square 16-1/2″ x 16-1/2″, and basted the overlapped edges together. Put the front and back pieces right sides together, sew all around the edges with 1/4″ seam, turn right side out and insert the pillow. Voila! There are a TON of bag patterns out there, and a lot of them are very good. However, they aren’t really a FAST way to use up orphan blocks! In contrast, there are several sources of good, sturdy, plain fabric bags that can be decorated with orphan blocks in very little time to make an attractive and useful bag. If you haven’t run across them, try craft stores. You can also Google “blank canvas totes” to find lots of options. I like buying them in dark colors so they won’t show dirt with use! NOTE: Even if you didn’t prewash the fabrics for your orphan block, you should prewash the canvas tote. Otherwise it may ruin your work by shrinking or bleeding color when it’s washed later. 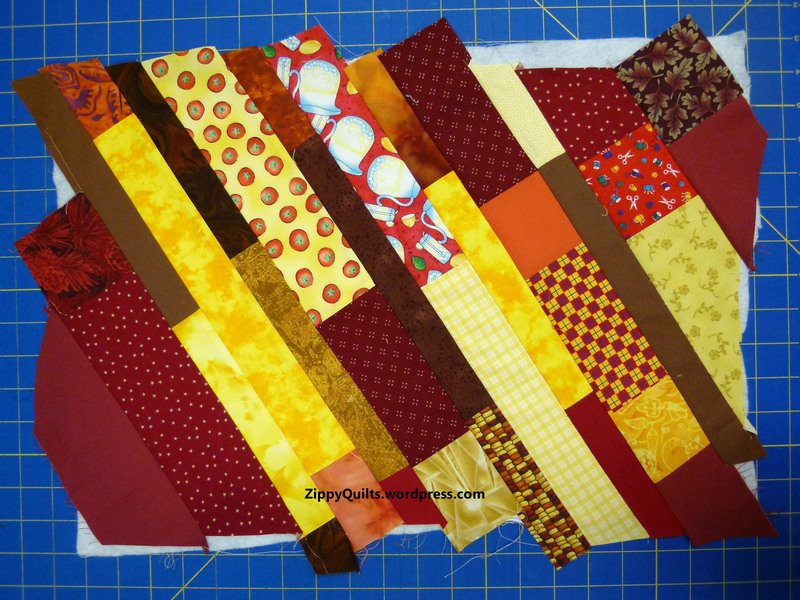 Choose your block and, if you want, quilt it with your choice of batting and a thin backing. It’s also fine to leave it unquilted. 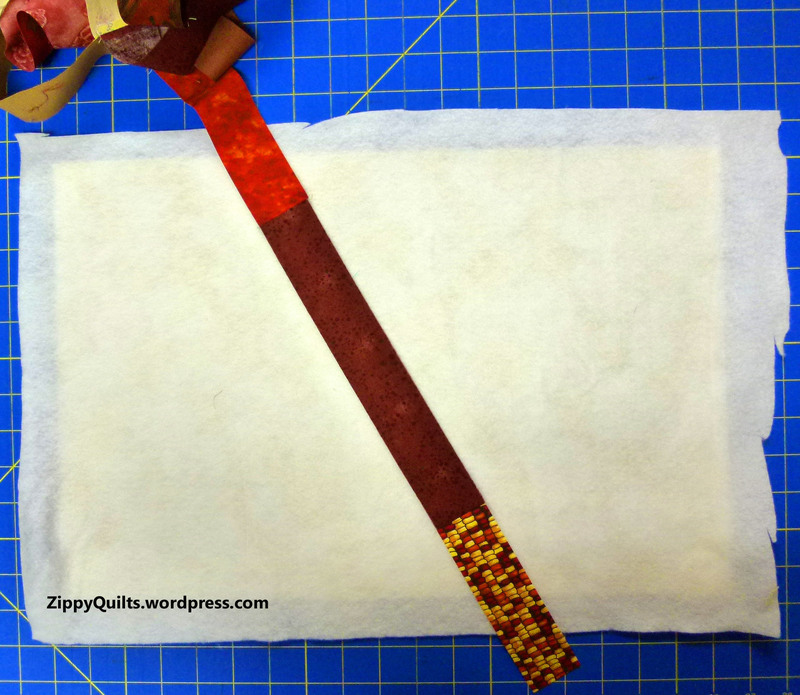 Once your block is ready to attach, either bind it or frame it with fabric. Alternatively, it works fine to just turn under 1/4″ on each edge. REALLY, you could just zig-zag stitch it to the bag without any edge finish. The only trick is that you need to make full use of the free arm feature of your machine, and squnch the bag a bit, to sew around the block. These bags aren’t very big, so it’s entirely do-able. DONE! This is a nice quick-and-easy project and a useful gift. But don’t use up all your orphan blocks—there are more projects to come! Orphan blocks (i.e., those not intended for a particular quilt “home”) JUST INCREASE ON THEIR OWN in the dark places where you store your quilt bits…I learned that I have SEVERAL HUNDRED when I started taking pix for this post. You get the idea—there are many sources of orphan blocks and many of us have quite a collection. 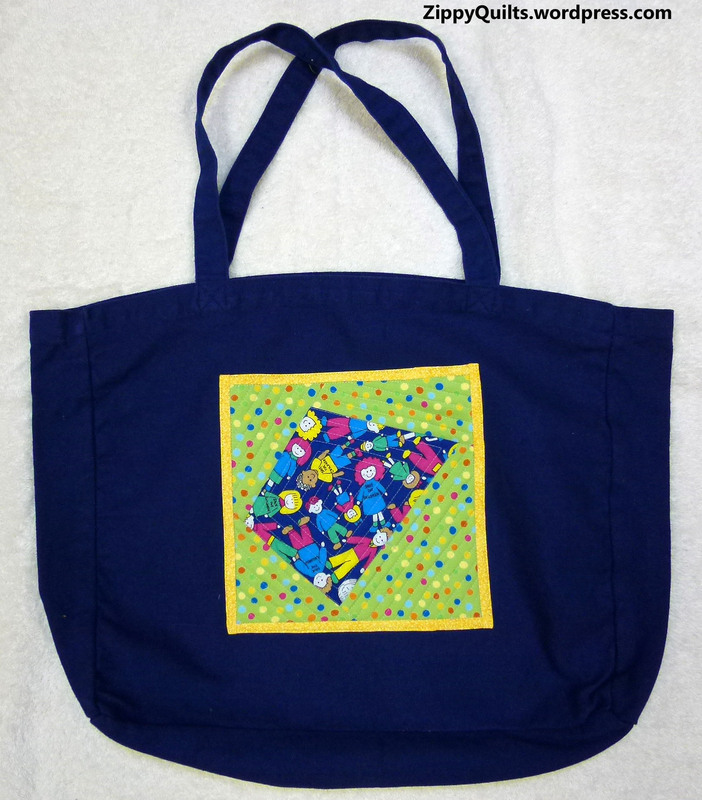 #5: Decorate a tote bag. You don’t even have to make the tote bag yourself! These make great gifts. #4: Make a throw pillow. Quilt it or not. Use to spruce up your couch or as a housewarming gift. #3: Decorate a “work shirt”. 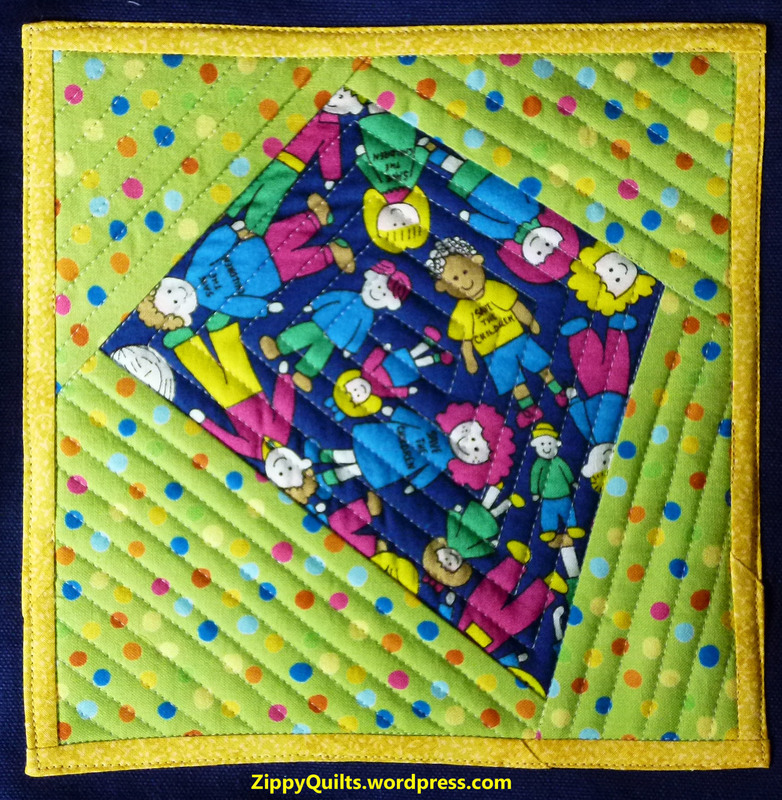 Great gift for quilty friends. 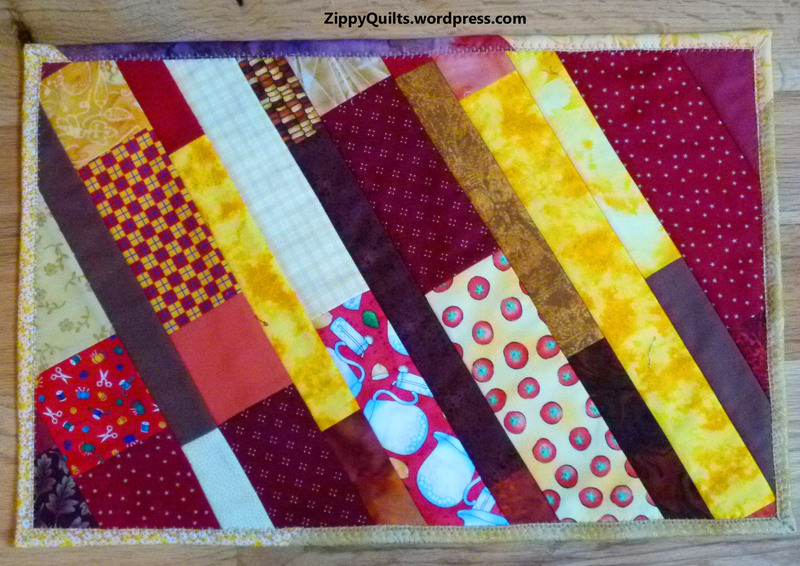 #1: Make a scrap quilt with an orphan-block focal point—MANY options with this one! As you can see from the pix at the top and below, I have lots of orphan blocks to use! I hope you’ll try out some of these ideas as I post instructions for them. Now this one has some potential! Made a couple and didn’t want to make any more! This block is indeed as old as the fabric suggests! A true orphan–inherited with my Granny’s stash! I STILL have some of these blocks left! SOMEBODY wanted to trade half square triangles and I went along…. Hexagon block because I wanted to cut up a stripe and make it! Copied from a block I found in my Granny’s stash! 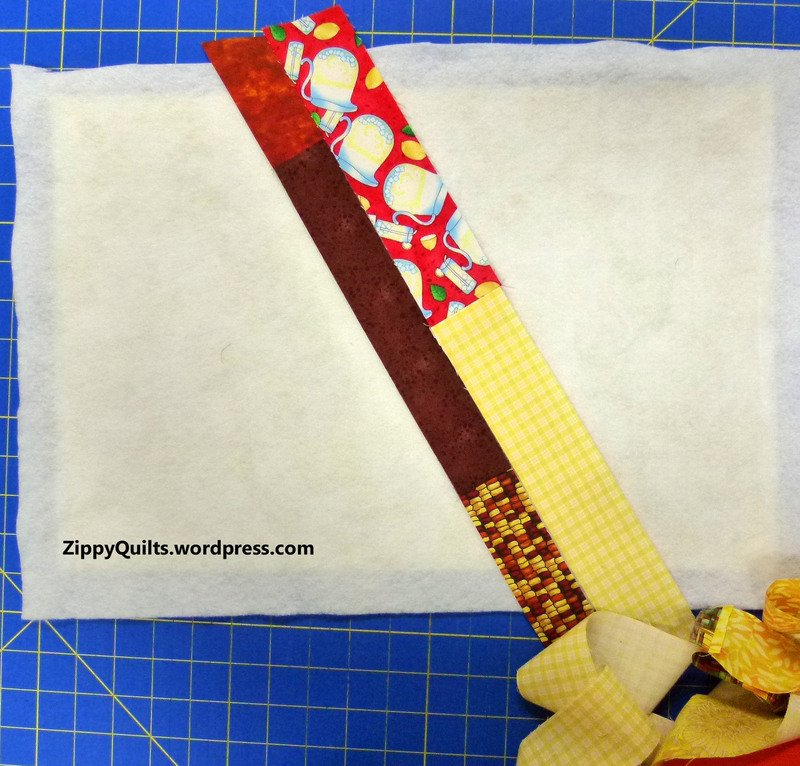 Here’s a QUICK, EASY way to use up scraps while making some gifts. Could be gifts for you, of course 😉 I like to make them ahead of time to have as hostess gifts, housewarming surprises, etc. 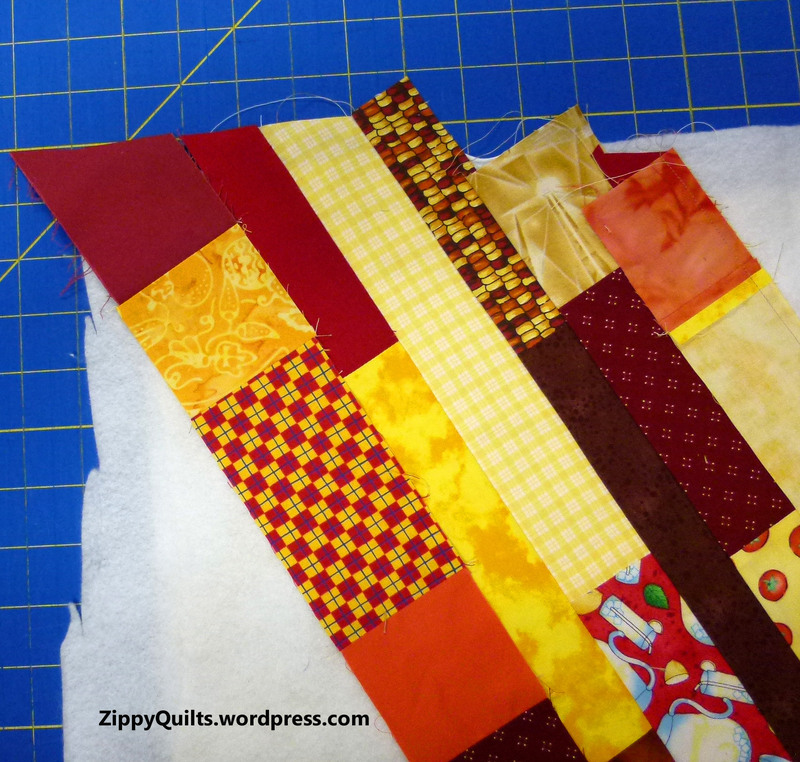 Start by cutting scraps into strips of set widths. 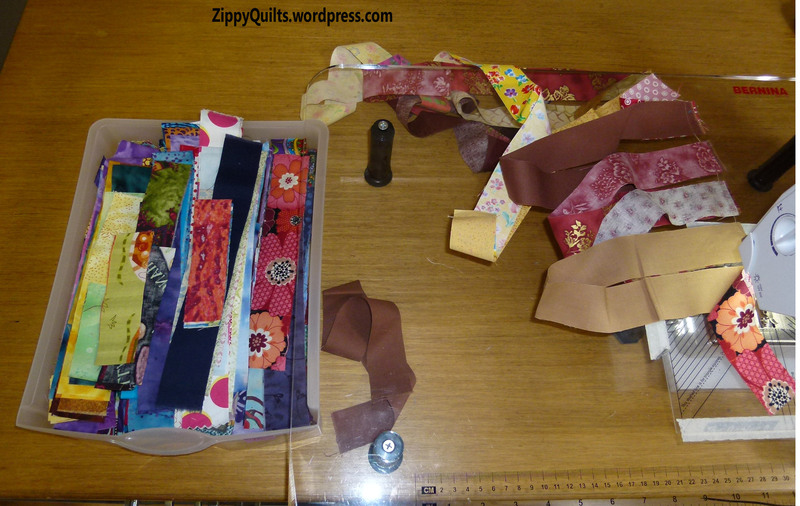 (I cut and sort all my scraps, so I have bins of strips ready to go.) In this project, I used strips in widths of 1.5”, 2”, 2.5”, and 3”. Sometimes I just use whatever color comes next, but for this project I selected yellow/gold, orange/red, and brown/tan scraps. I joined the strips end-to-end to make long strips of a given width. So, for example, a strip may be 1-1/2 inches wide and be made up of scraps of various lengths from 1-1/2 inches to about 8 inches. After piecing my long strips, I started a placemat as follows. I cut a piece of backing 14 x 20 inches, layered a piece of batting 13 x 19 inches on top (batting scraps, yes! ), and placed a strip in the middle of the batting. [picture] I used the flip and sew method to add strips on each side, sewing through all layers as I went so that I was quilting while assembling the placemat top. Strips can be oriented horizontally, vertically, or at any angle you choose! You can mark your first line to be sure it’s straight if you want, but I just eyeballed it. I pressed after adding each strip, and every few strips I turned it over and ironed the back of the mat, too. When the mat was finished, I trimmed it to 12 x 18 inches. Note that it helps to make the last strip added a wide one so the mat can be trimmed to size without leaving a really skinny strip on one edge. I bound the edges with scraps of bias binding left over from various quilts as well as scraps from my bins. I got four mats done easily in a day, so this would work as a last minute gift—we all need those!